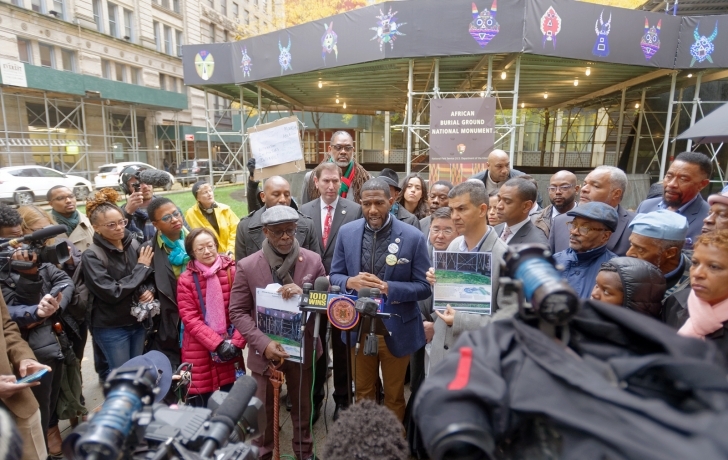 City Council members and others gathered in front of the African Burial Ground on Monday to condemn the violent, racist graffiti scrawled on the national monument four days earlier, and calling for the vandal’s arrest. On Nov. 1, the same day that the African Burial Ground at Broadway and Duane Street had been defaced, a Brooklyn temple was vandalized with anti-Semitic graffiti. Days before, 11 congregants were murdered at a Pittsburgh synagogue. At the event on Duane Street, members of the City Council’s Jewish Caucus joined in solidarity with the leadership of the Black, Latino and Asian Caucus. “An attack against one of us, an attack against one community, is an attack against us all,” said Councilman Chaim Deutsch of the Jewish Caucus. Deutsch said he is working with others in the Council to introduce two bills to combat racism in the city. One would add an educational arm to the NYPD’s Hate Crimes Task Force that teaches children and community groups about other cultures. The other bill would require the District Attorney’s office to find the motives behind hate crimes, “so we can better put in the resources and educate the public so that incidents like this should never, ever, ever happen again,” Deutsch said. “It was a cruel reminder that in spite of the diversity of our city we are not immune from acts of hate and violence being perpetuated with all too common frequency throughout our country in recent days,” he said, recalling also the defacing of the Brooklyn synagogue and the recent pipe bomb mailings. The case is being investigated by the NYPD’s Hate Crimes Unit, the National Park Police and the Department of Homeland Security, Robert Sperling, a Homeland Security spokesman, said. Several surveillance cameras were operating in the area and their pictures are being studied, he said.